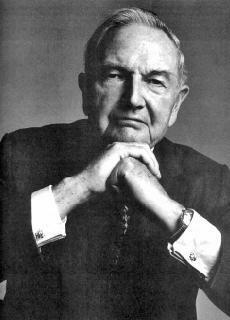 David Rockefeller in an unnatural cabalistic pose. Father John Davison Rockefeller Jr. Youngest son of John D. Rockefeller. Founder of many one world government think tanks, and self proclaimed globalist. Headed up Chase Manhattan bank. In a visit to the Soviet Union David Rockefeller met with then leader Nikita Khrushchev where he was then told that Rockefeller’s daughter Neva would one day live under a communist system in the United States of America.